Supreme Court nominee Judge Brett Kavanaugh is sworn in before testifying during the Senate Judiciary Committee, Thursday, Sept. 27, 2018 on Capitol Hill in Washington. The tail end of Brett Kavanaugh's Supreme Court nomination process released a powerful next phase in the #MeToo movement, as women poured out their previously untold stories of sexual assault. The political wrangling, meanwhile, provoked a furious, largely partisan, clash. Two stories entwined, each offering multiple individual threads to explore. NPR's listeners and readers found plenty to praise and also to critique across the 12 hours of live special coverage and extensive newsmagazine and online coverage. My analysis, as always, takes into account a wide breadth of coverage. Much of the coverage was very good. Yes, there were occasional slip-ups: some crude language in the special coverage commentary, and bits of analysis that came across as overly partisan when NPR's staff failed to cite sources for their conclusions. Those I chalk that up to the stresses of live radio (and I later heard the news staff make a concerted effort to clarify words that might come across as loaded). Two other themes in the listener and reader concerns stood out and deserve a deeper look. Both involve fairness. The role of NPR, as I see it, is to provide listeners and readers with the facts of a situation, and, secondarily, multiple perspectives on how to interpret those facts, or on how those facts are being received. Either way, listeners and readers then get to form their own opinions about the issues. Overall, I thought the coverage tackled a wide spectrum. But on a couple of occasions, the balance tipped. One time when the proportion was off was on the Sept. 30 Weekend Edition Sunday show. That was three days after the nearly nine hours of Senate Judiciary Committee testimony of Christine Blasey Ford and Judge Brett Kavanaugh regarding Ford's allegations that Kavanaugh had sexually assaulted her when they were teenagers. That day, nine stories (out of a total of 20) somehow dealt with the Kavanaugh nomination, or the fury of the many women who began sharing their own stories in the aftermath of Ford's allegations. 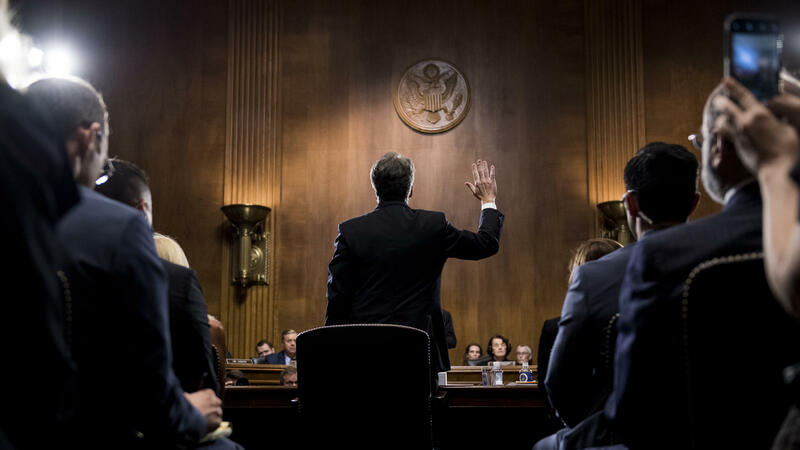 The show started with analysis from Mara Liasson, who came to the conclusion that "if we are in an ongoing kind of stress test of our democratic institutions, Thursday was a day when those institutions really seemed to buckle under the stress." That was followed by an interview with a guest who argued that Kavanaugh, in his testimony, "seems to have been dishonest and misleading sort of throughout." After a piece about a name change in Macedonia, there was an interview with Ana Maria Archila of the Center for Popular Democracy, concerning her Capitol Hill elevator confrontation with Arizona Senator Jeff Flake about her own sexual assault. All that was in the first half-hour of the program. Later, a high school student was interviewed regarding her Huffington Post op-ed about her anger while watching the day of hearings. A reported piece interviewed two men for their reactions (one reflected on his own inappropriate past actions); a compilation of reaction from women featured mostly those who were profoundly moved by watching the hearings. There was another interview, about the role of race and gender in the Ford-Kavanaugh hearings, with a former member of the legal team that assisted Anita Hill when she testified in the confirmation hearings of Justice Clarence Thomas. Molly Ringwald was interviewed about the 1980s films (including ones she starred in) that glorified the high school party scene. Amidst all this was an interview in the show's second hour with Rich Lowry, editor of the conservative National Review. As the headline on the piece says, he was brought on for a "Conservative Take On Kavanaugh Hearing And Investigation." Instead of conveying the range of perspectives that was intended, the labeling came off as a profoundly "other-izing" approach, particularly since no other interview was similarly labeled as a "liberal take." Likewise, it was odd to ask the high school student who was angered by the hearings to talk about what she had heard from other students who felt Kavanaugh was being treated unfairly. It's better to let someone speak for themselves. Host Lulu Garcia-Navarro largely articulated alternative points of view in the interviews, as hosts should. Taken individually, the interviews and perspectives were valid. But overall, there was a lot of commentary on the two stories — sexual assault and the hearings — all from one side, and very little actual reporting to advance the story. "Christine Blasey Ford's testimony happened at a particular moment in time, one year into the #MeToo movement that is reshaping the way society deals with issues of sexual harassment and assault. This cultural moment informed the response of women of all backgrounds and political preferences — many re-living their own experiences of sexual assault — and extended beyond the question of Brett Kavanaugh's fitness for the Supreme Court. We wanted to explore that moment in all its complexity. The show did include several perspectives that were supportive of Kavanaugh or expressed the feelings some men were experiencing. However, I can understand how some listeners heard the exploration of this cultural moment as an implicit commentary on Kavanaugh's fitness for the Supreme Court." "When it comes to impartiality and balance we hold ourselves to the highest standards. And I think it's fair criticism that there were moments in the many, many hours of excellent Kavanaugh coverage, across our multiple platforms, where the balance of voices was off. In this hyper-partisan moment, it's a reminder that the trust of the audience is hard earned and easily undermined." I'm not arguing here for reflexive balance; that does not serve the truth. For example, there's no counterpoint for an interview with a woman has been sexually assaulted. But the truth is not served, either, by piling on with stories that leave a listener with the impression that everyone feels the same way about these issues. A half-dozen readers from across the political spectrum wrote in to protest the choices of a couple of the photos used of Kavanaugh on npr.org, including the one at the top of the page here and then leading the nine-photograph slide show partway down the page here. Those who complained about the photos variously thought they were "unfair," "unflattering," "prone to evoke a negative impression" and "an attempt to make Kavanaugh look as mean and ugly as possible." One point: The leading image of the slide show led the npr.org home page at some points, so it perhaps took on greater importance if the readers encountered it there. That said, after talking to the newsroom, it's clear they put quite a bit of thought into the choices. Nicole Werbeck, NPR's senior supervising editor for visuals and engagement, said the slide show was designed to represent the full scope of the Senate Judiciary Committee hearings, including the senators, the special prosecutor and, of course, Ford. Two other photos of Kavanaugh were included, both of which showed him with a less-emotional demeanor. "What I always try to make sure of is that we're giving a full picture of what we're seeing for the day, and try to make it as fair and balanced as possible," Werbeck said. Photos, of course, can convey in a glance what could otherwise take a pile of words, and they can absolutely be prejudicial. But the one takeaway from Kavanaugh's testimony that dominated the conversation afterward was exactly that anger that he showed; the president praised it, and many analyses in recent days have argued that it was a key factor in saving his nomination. If one had to choose a single photo to illustrate his testimony that day, a photo of his furious face (and the ones NPR chose were far from the most unflattering photos out there from which to choose) seems to me to be the most accurate choice. One final point: A couple of readers suggested that NPR should "provide equally unflattering images of all sides," as one put it. Rather, I'd argue that NPR should choose photos that convey what happened. One person got angry; the other didn't.